Above, Vestavia senior Anna Grace Darty in action against Mountain Brook on March 21. The Rebels won 5-0. Journal photos by Lee Walls Jr. 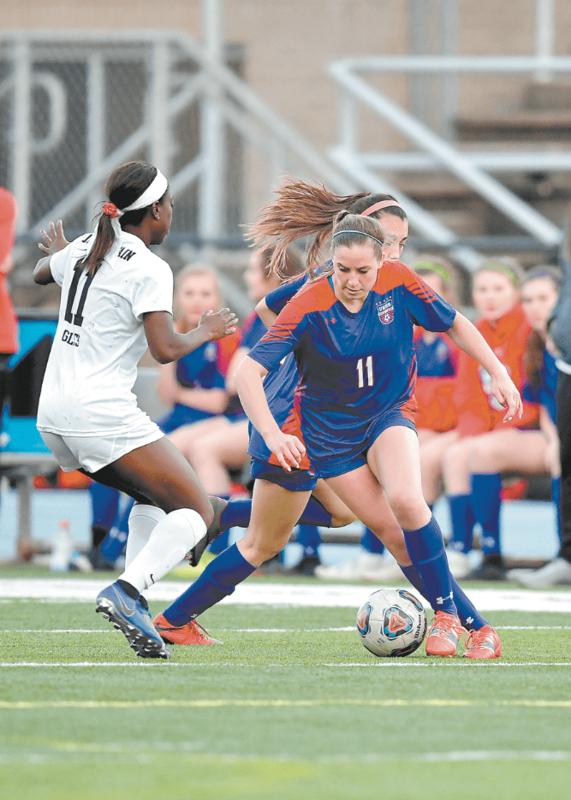 The Vestavia Hills girls soccer team has built quite a dynasty under coach Brigid Meadow. They’ve won two 7A state championships, including last season’s, and two 6A state championships under her guidance during the past 15 seasons. Vestavia senior Caroline Causey (11). Meadow credits the leadership of her senior class with the team’s success. That class includes Anna Woodson, Anna Grace Darty, Caroline Causey, Georgia Kamburis and Lizzie Hill. Keeping that large group intact has been paramount to her team’s success. “You want to develop a belief and have that belief shared among every player,” she said. “Our belief is we’re going to work harder than anybody else,” Meadow said. “We’re going to study our opponents as much as we can. Meadow also has a large sophomore class that is contributing to the Rebels’ success. 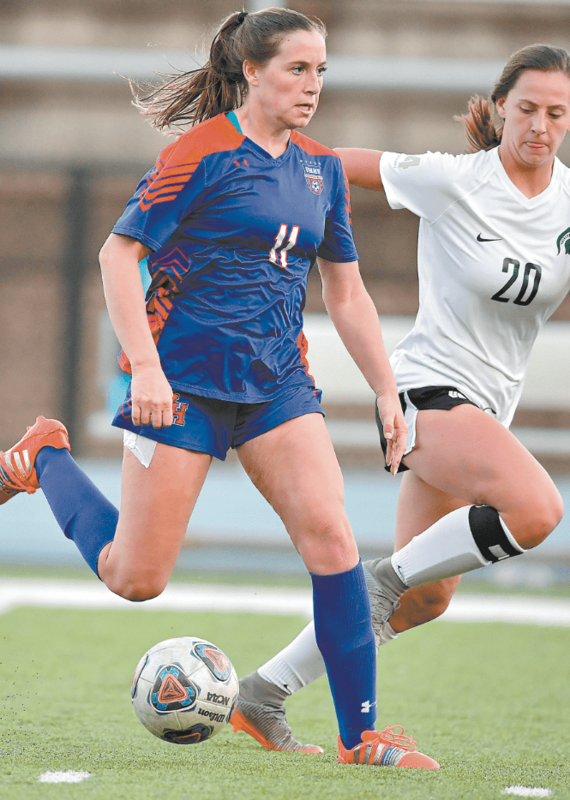 Christina Hernandez, Madeline Bunch, Grace Ellis, Kaylee Dressback and Riley Vicinanzo are among the underclassmen who have made an immediate impact in the 2019 season. They’re already starting. The Rebels reached spring break this season undefeated. Before the season is done, they’ll not only have an opportunity to repeat, they’ll have an opportunity to notch Meadow’s 300th career victory. 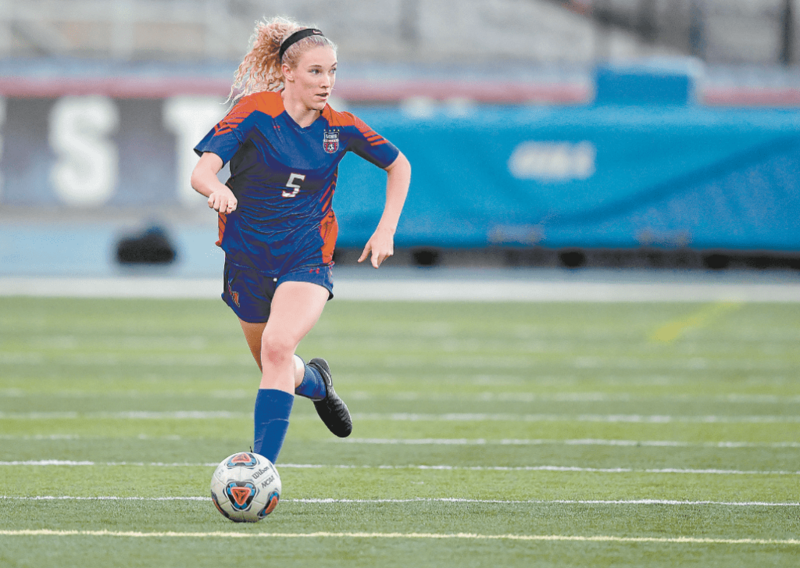 It’s an impressive career that Meadow says she couldn’t have continued without the support of a lot of people; her own family, certainly, but also from school administration and the parents in the community who have made it easy. They plan team meals, pack meals and snacks for road games, stock water on the sidelines and they’re not selfish, Meadow asserts. With the help, she’s received, she has no plans on slowing down any time soon. Personal milestones aren’t the goal for Meadow. Making the playoffs is the goal. And to do that, she’ll push her team to improve every day. Vestavia Hills returned from spring break to travel to Huntsville on Tuesday. That contest concluded after this issue went to press. Their season continues Thursday, when the Rebels host rival Hoover. On April 6, they’ll travel to Mill Creek, Georgia.